Here’s a red-letter date in the history of science: November 5, 1955. Yes! Of course! November 5, 1955! That was the day I invented time-travel. I remember it vividly. I was standing on the edge of my toilet hanging a clock, the porcelain was wet, I slipped, hit my head on the sink, and when I came to I had a revelation! A vision! A picture in my head! A picture of this! Guy Fawkes was a member of the Gunpowder Plot to blow up the house of Parliament with King James I inside. He was caught while he was guarding the firewood and 36 barrels of gunpowder and hung by the neck until dead. Anne Boleyn influenced King Henry the VIII to break away from the Catholic Church in order to form his own Church of England and get a divorce from his current wife, Catherine of Aragon, so that he could marry Anne Boleyn…phew. Because of Henry the VIII’s lust for Anne Boleyn and Anne’s lust for power, Catholics became a minority. Henry the VIII declared himself the only supreme head on earth of the Church in England’ in place of the Pope. As well as claiming both spiritual and political power over its followers and thus any allegiance to the Catholic Church would be seen as treason. Sir Thomas More and Cardinal & Bishop of Rochester, John Fisher were both executed for their Catholic beliefs and were later seen as martyrs to the Catholic faith. The treatment of Catholics dwindled and this went on for years. 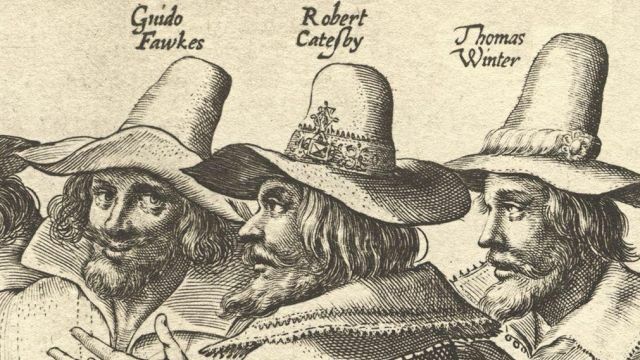 In the 17th century, fed up with the poor treatment and oppression of Catholics under the reign of King James I, Robert Catesby led the Gunpowder Plot of 1605. It was their intent to kill King James I and have his nine year old daughter, Princess Elizabeth, be installed as the Catholic head of state. The Plot was revealed through an anonymous letter, which led to Guy Fawkes being captured November 5th. Catesby was one of the men killed in the stand off with the Sheriff. Guy Fawkes and seven others were taken into custody, later tortured and executed. Guy Fawkes was hung by the neck until dead and his body was then quartered and sent to the four corners of the kingdom as an example of what happens to traitors. Suffice it to say this did not help improve the view of Catholics throughout England. To escape Libyan terrorists Marty McFly uses Doc Brown‘s DeLorean and accidentally travels 30 years into the past to November 5th 1955. This date just so happened to be an important date in history for not only Doc but Marty as well. This was the day Doc Brown invented time travel. This was also the day George McFly was hit by Sam Baines‘s car resulting in Lorraine having feelings for him. This of course was in the original timeline, prior to Marty’s arrival. He plows over one of Old Man Peabody’s Pine trees, thus altering the name of Twin Pines Mall to Lone Pine Mall. He meets his father in the Coffee Shop and gives Goldie Wilson the idea to run for Mayor. Like stated above, he saves George from the car which inspires Lorraine to have feelings for Marty instead, ala the Florence Nightingale effect. He meets Doc Brown and shows him that indeed one of his experiments works. Making a difference in his life and giving him something to shoot for. and this is all just day 01.
and today just so happens to be a very special birthday. make sure you enjoy your Weekend! !